You Died But a Necromancer Revived You is coming to Switch next week, according to an eShop listing. It’s confirmed for April 19 in both North America and Europe. Reaching the top to challenge the Necromancer is no easy feat, the pathways are narrow and full of traps: chainsaws, spikes, cannons, flamethrowers… On top of that, the floor behind you will start exploding if you take too long! – Procedural Levels: Every floor is different! – Up, Down, Left, Right! : Simple to pick up but hard to master. – Up to 4 players: Cooperate! Only one needs to complete the floor. – Versus mode: Or compete! Let’s see who completes the floor first. – Endless mode: How high can you climb without dying? – Customizable difficulty: Settings to make the game easier, harder or just for fun. – +30 characters: ​Lots of characters to choose from! They do not bring any gameplay advantage – it’s all about taking your favorite skeleton into the tower. 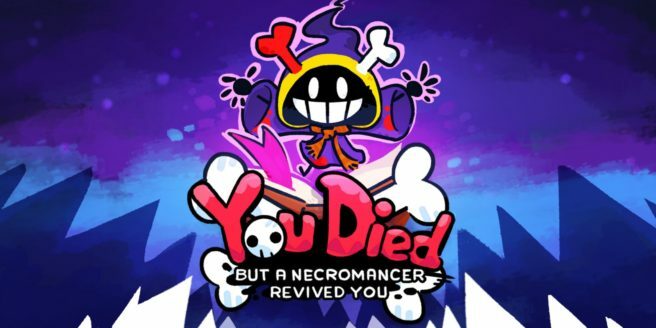 You Died But a Necromancer Revived You will cost $8.99 on the Switch eShop.